Australia continue to light up the youth international basketball scene. 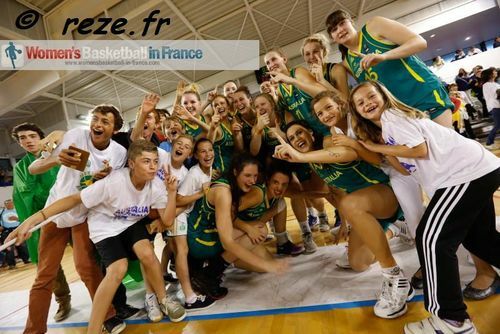 They won the 25th edition of the Réze International Basketball (RBI) tournament with a victory against France (66-60) in the final. 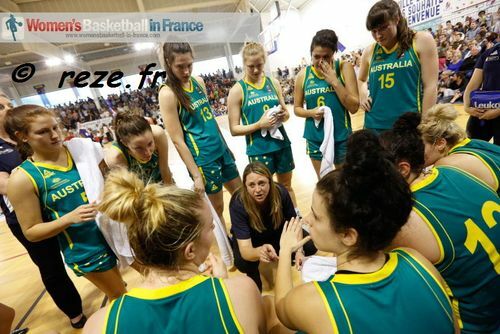 Cheryl Chambers, the coach of the Australia U19 team, likes to play high tempo basketball, demonstrated merciless by her team during the first three days of the tournament. Australia crushed Russia on the opening day (79-29) and then put up another impressive defensive effort in beating Poland (59-37). They ended the group phase with a comfortable victory against Argentina (84-43). Carly Mijovic (in green in picture) who led her team in points and minutes was voted MVP for her performance over the four days in which she top scored with 69 points. Although the Australian team appear to be more balanced than their 2009 and 2011 representatives in the U19 group, Mijovic was the stand-out player of the tournament. It is very likely that the Gems roster of Mijovic, Louise Brown, Alicia Froling, Darcee Garbin, Tiana Mangakahia, Vanessa Panousis, Maddison Penn, Casey Samuels, Lauren Scherf, Stephanie Talbot and Tahlia Tupaea should be the 12 players to represent Australia at the U19 FIBA World Championship later this year. 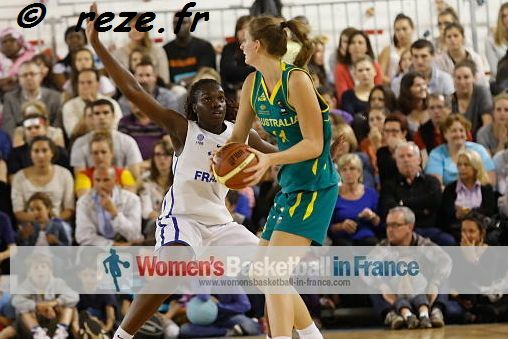 In the final match Australia were given their toughest test and had to change their game plan to beat France (66-60). In a classical youth international basketball style they alternated a strong inside outside offensive game with clutch shooting. France's more physical approach almost paid off despite them trailing for most of the game as they made a late surge. When Mijovic fouled out before money-time, her Australian team mates just survived France's attack. They won the game with some calm free-throw shooting down the stretch from their youngest player Tupaea. Mijovic led again the scoring for the Gems with 17 points while Samuels contributed 16. This is the second time that Australia has taken the trophy home. Mamignan Toure was the leading scorer for France with 17 points. The RBI is a major preparation event for six other teams already qualified for the U19 World Championship. Poland who are not going to the U19 World Championship came with their U18 team. The dream of playing for France at the FIBA World Championship for Women ended even before the RBI for the following player: Pauline Betis (1.70, 1994, USO Mondeville), Imane Brahmi (1.85, 1994, Rennes), Natty Chambertin (1.84, 1994, Aix-en-Provence), Coralie Desprez (1.70, 1994, Dunkerque Malo), Lisa Faurez (1.87, 1994, Dunkerque Malo) and Angelina Turmel (1.97, 1996, CFBB). Yet the selection battle continues for the remaining French players. 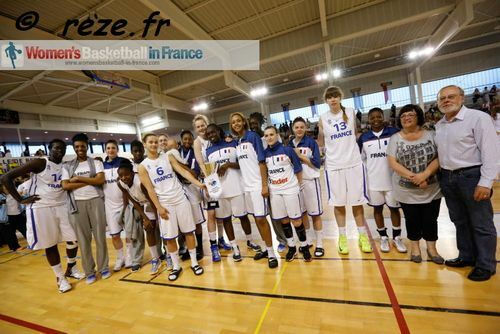 Before this tournament France had played a couple of games against Argentina which they won (80-38) and (69-54). Next stop is the Mediterranean games from 16 until 25 June in Turkey for the U19 team.